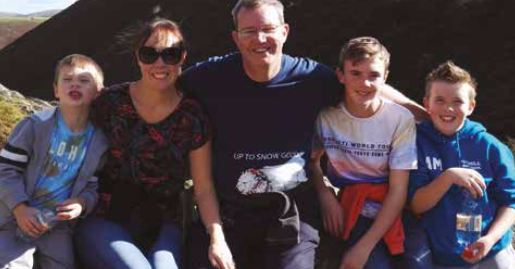 Claire, (41) and Lewis (13) from Shropshire assist in raising awareness of the conditions by telling their story and the challenges of doing every-day tasks. “When I was younger, I used to do a lot of dance and amateur dramatics, and I remember rehearsals being in a very old, cold village hall. My fingers would regularly go white and numb but I just ignored it and the feeling would eventually return. It wasn't until I was in my 20s that the condition worsened and I felt I needed to seek help. By this point, I was living in Scotland with my now-husband. We used to go out walking a lot and I remember my fingers being extremely painful, to the point of making me feel nauseous and dizzy. I've had numb fingers for most of the winter, this is the worst time of year for me but spring and autumn are pretty bad as well, because they're the times you maybe don't have the gloves or the extra layers, to cope when the temperature suddenly drops. A lot of the problems I have tend to be when it's wet and windy, and you get that wind chill. I have to have gloves in every coat, every fleece and hoodie that I own, just for going out and about, and as soon as they get a bit damp then that's just horrendous, too, so I have to have a spare pair with me as well. My fingers have the classic symptoms and will go white and numb. It's usually the same two that go first and if it's a bad flare, they'll all go. When it's particularly bad, it's extremely painful and they'll go blue and then red and there's quite a lot of pain when the circulation does return. You just have to sit and wait for it, you can't do anything about it, and it can take up to an hour for that to come back. I have been diagnosed with Raynaud's since my 20's and I now make sure I have Nifedipine with me so I can take one when I'm having an attack. I squeeze it under my tongue and it seems to shorten the length of them. It has definitely improved the frequency of attacks and I'm one of the lucky ones that has no side effects with the drug. You want to be able to do anything you want to do, not think: 'Oh, I can't do that because . . .' and that's something my eldest son Lewis, who also has Raynaud's, has found as well. Lewis: It seems as if Raynaud's is hereditary in our family and my mum thinks she probably had it when she was younger as well, quite mildly, as she remembers her fingers going white and numb but never did anything about it. I was diagnosed last year and see a Paediatric Rheumatologist yearly. The indications are it is primary Raynaud's, like my mum. I take Nifedipine also, which has really helped my symptoms. I started to experience symptoms when I was about 10, we didn't seek help until a while later. It has affected my sports, I used to play a lot of tennis but had to stop playing during colder months as I struggled to hold the racquet. Football is tricky, but as long as I layer up and wear gloves it's OK. I do feel quite self- conscious, I don't want to be different and be wrapped up in summer so sometimes I don't wear my coat or gloves, when perhaps I should. Claire: I also have two younger boys, so our house is very busy doing everyday tasks like cooking and washing! I struggle to stand on the touchline watching my boys play football - Cold feet, cold everything — what I tend to do is sit in the car, as much as possible, and stand out when the match is on. Everything just has to be planned ahead, such as if it's particularly cold putting the gloves on the radiator before you go out, getting my wellie boots out of the garage so they warm up first because I get it a bit in my toes as well. A problem I always have, is putting washing out on the line. Whatever time of year it is, that's always really hard because the clothes are cold coming out of the wash and, if there's a bit of a cold breeze, by the time you've done it you can't feel your fingers. It can make things difficult, even going to the supermarket and getting things out of the fridges or freezer aisles, by the time I get to the checkout to pay can't feel my fingers to get my card out to put in the machine — I feel like an old woman. warm up to room temperature, particularly things that take a lot of peeling. If you mess that up, you're liable to lose a finger, so if I haven't got them out in time I have to get my husband to do it — which is no bad thing! I work in a hospital as a Respiratory Specialist Nurse. Thankfully my new office is in the main building, so once I've warmed up from walking in I'm good to go! I used to be a Research Sister in the Clinical Trials Team and whilst it's fortunate that hospitals are warm environments, unfortunately, that office wasn't in the main building and I have go in and out of the building several times each day, which means I'd risk an attack. I wanted to get involved with SRUK because having lived with the condition for so long I feel it's really important more people know about it. If it means more people get treatment earlier, then that's great. I'd also like more people to know that if you have Raynaud's you're not just being "a bit wussy", a little breeze or slight drop in temperature can a have big impact on you! Keep up the good work SRUK. Share your stories of Scleroderma and Raynaud's.